The Saddle Inn, Great Marton, Blackpool. The Saddle was at the heart of the agricultural community of Great Marton. Like other inns in the Fylde there were regular auction sales of farms, cottages & land. In the event of a death in the locality, the inquest was usually held at the inn. 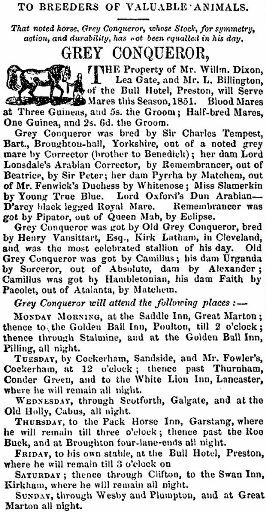 Advert for Grey Conqueror, a stud bred by Sir Charles Tempest of Broughton Hall, Yorkshire, and owned by William Dixon of Lea Gate & L. Billington of The Bull Hotel, Preston. Blood Mares 5s. the Groom, Half-bred Mares, One Guinea & 2s.6d. the Groom. Taking five days to pass through the Fylde & Wyre in 1851, he stopped at: The Saddle, Great Marton, Golden Ball, Poulton, Stalmine, Golden Ball, Pilling, Cockerham, Sandside, Thurnham, Condor Green, White Lion Inn, Lancaster, Scotforth, Galgate, Old Holly, Cabus, Pack Horse Inn, Garstang, Roe Buck, Broughton, Clifton, Swan Inn, Kirkham, & Westby with Plumpton. The Preston Guardian, Saturday, January 10, 1852. On Saturday last, after a short illness, Mr.William Parkinson, innkeeper, Saddle Inn, Great Marton, aged 53. 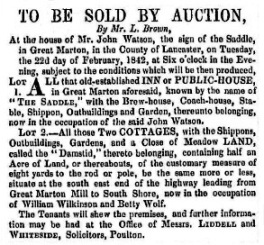 Auction Sale held at the Saddle Inn, Great Marton, 30th August, 1870. 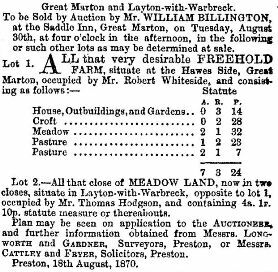 This sale was for Robert Whiteside's Hawes Side Farm, Great Marton & also meadow in Layton with Warbreck. Farmers attended many these sales to increase their holdings. The Preston Guardian, Saturday, March 21st 1874. The license of the Saddle Inn, Great Marton, was transferred from Joseph Walmsley to Ralph Hodgkinson. The Preston Guardian, Saturday, December 26, 1874. SAD DEATHS THROUGH EXCESSIVE DRINKING AT A SALE. 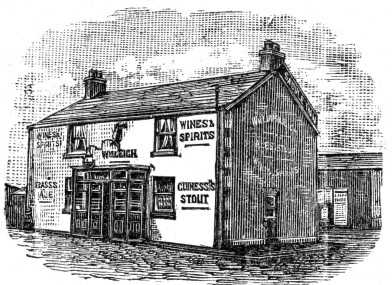 One of the saddest instances of deaths we know of—the facts of which were briefly reported in our last issue—through allowing an unlimited quantity of drink at sales has recently occurred at Great Marton, near Blackpool. At the inquest held at the police station; Blackpool, on Saturday afternoon, before Mr. Alderman Gilbertson, coroner, it was stated that two men, named Thomas Cartmell, labourer, 42 years of age, and John Sanderson, farmer, 27 years of age, both of whom resided at Great Marton Moss Side, went to a sale of property at the Saddle Inn, Great Marton on the afternoon of yesterday week. From the evidence adduced by a number of witnesses it would appear that when the men got to the public-house they began to partake freely of intoxicating liquors, and there was at their disposal on the kitchen table gin, rum, whisky, part, and sherry. When the sale commenced in another room more of the same kind of liquor was placed on the table for the use of those attending the sale. The property sold very high. The two deceased men continued to imbibe the " cheap drink," and the auctioneer (Mr. Butcher) remarked that Cartmell was getting " very fresh." In time he got so fresh that he had to be taken out of the room, Sanderson following him. About six o'clock the same evening Grace Cartmell, daughter of deceased, was sent to fetch her father home. When she got to the inn, deceased, who was very drunk, was brought to the door by the landlord and another man. No sooner had he got outside than he fell full length on the footpath. Here he lay till assistance was procured, when he was conveyed to a barn on the opposite side of the road. It was impossible to make him understand or take the slightest notice of what was being said to him. Meanwhile the sister of Sanderson went for her brother, and found him "all of a hump" on the sofa, with his head down. Both were put in a cart and taken home. The night was very cold. When they were lifted out of the cart they appeared to be dead. The same night Dr. Sharp was called to Sanderson, and pronounced him dead. Witness had known deceased eight or ten years, and said he was always a delicate man. He also knew Cartmell as a stout, hard-working man. On making a post-mortem examination of the body of the latter he found no marks of violence save a few external bruises as might be produced by a fall. The brain, lungs, end kidneys were healthy, but greatly congested, and in the stomach there was some food half digested. The bladder was very full. In 'his opinion deceased died from congestion of the brain produced partly by an excess of drink, and partly by being exposed to the cold. In the case of Sanderson, as being a weaker man, he thought the same causes would have a speedier result. After the coroner had summed up the evidence, the jury returned the following verdict :—" That the deceased died from congestion of the brain, produced by the excessive use of ardent spirits, aggravated by exposure to the cold." The jury also censured the practice of the unlimited supply of intoxicating liquors on the occasion of sales of property. Mr. Gilbertson coroner, held an inquest on Monday, at the Saddle Inn, Marton, on the body of Andrew Whiteside, aged two years and seven months, son of Andrew and Lavinia Whiteside, Great Marton. The deceased had been unwell for a week. On Wednesday he was stood upon a chair, leaning over the table, when he took hold of the teapot, and, before his parents were able to prevent him, he drank some of the hot tea out of the spout. He immediately began to vomit, and continued to do so for some time. His mother gave him some syrup. Dr. Sharp was called in next day, but, notwithstanding that gentleman's efforts, the deceased expired on Friday. A. verdict of "Died from natural causes, accelerated by drinking hot tea," was returned. A paper bag used for spirits sold at The Saddle to drink off the premises c1900. 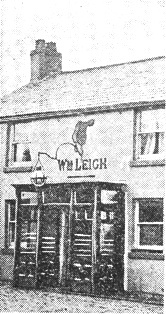 William Leigh was landlord of the Saddle Inn from 1892. The building was extended in 1924. His wife, Elizabeth, was still there in 1949. Blackpool Herald, November 26th, 1949. WHILE talk of limiting the power of the House of Lords is in the air, let's take a look at a House of Lords where they never reach a decision, although in session every day in the year. This House of Lords is a room in one of the Fylde's oldest inns, The S a d d l e, Whitegate-drive, Marton. The inn, which is over 100 years old, possesses also a House of Commons, but the Lords is far superior, because in here no women are allowed. That, however, doesn't make it any quieter There's just as much talk. And if discussions on things like devaluation and atom bombs usually work round to Stanley Mortensen and Stanley Matthews who will blame them ? Over the doorway of each is a sign—"House of Lords" on one, " House of Commons " on the other. The Saddle has the oldest inn tenant in the Fylde, Mrs. Eliza Leigh, who has been there for 57 years. MRS. LEIGH recalls that up to 70 years ago the inn was called the " Roundabout," in the days when Whitegate- drive was a mere lane and the one road to Preston was Preston Old-road. With her husband, Mr.William Leigh, who died 15 years ago, Mrs.Leigh came to the Oxford Hotel in 1891 and then they moved to the Mrs. Leigh Saddle a year later. That was in the days when horses were fed and given water in the stables at the front of the inn. The front of the inn in those days is now the back. All traffic on the way to Preston would stop at the Saddle. Mrs. Leigh remembers that in those days unless she could obtain a lift on a milk float she had to walk into Blackpool and that in those days there was maypole dancing on the green, now Oxford-square. The inn was surrounded by farms and meadows with just a few houses and only five farms between the inn and Devonshire square. About 25 years ago the inn was extended 14 feet on the south gable. The stables at the back are now used as storerooms. OLD customs have been kept alive there probably longer than in other places, for in spite of Blackpool's growth Marton is still Marton and tradition still dies hard. On Simnel Sunday before the war there was always a slice of Simnel cake and a glass of mulled ale made with eggs and served hot for the customers. For years at Christmas Mrs. Leigh has always given an apple and an orange to the children in the village, something which they still look forward to. Up to about 30 years ago the governors of Baines's Endowed School had a dinner at the Saddle on Candlemas Day, February 2. The late James Cardwell, three times Mayor, of Blackpool, attended this with Mr. John; Ferguson, the Rev. James Crabtree and several others. There was always a leg of lamb, roast beef and plum pudding set alight with brandy. THE rooms of the inn are always a full or seem to be because of the old prints that line the walls. It looks rather like a small art gallery for the pictures include Queen Mary, Queen Alexandra, Queen Victoria and the Kaiser in his prime. This fascinating collection belongs to Mrs. Leigh and as well as Royalty there are prints of old battleships. In 1942. Mrs. Leigh celebrated her jubilee as tenant of the Saddle and among her gifts were 50 roses from the directors of Catterall and Swarbrick's brewery.